Triad Engineering, Inc. is committed to protecting the well-being of its employees, property, and the community and environment in which we work. It is our policy to conduct all operations in a safe and healthy manner. The health and safety of every employee is absolutely paramount and its consideration must be a value to the organization. 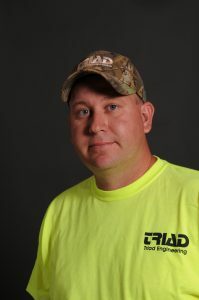 Triad’s Safety Employee of the Month for April is John Mercer! John Mercer, Engineering/Laboratory Technician in the Morgantown office, has been selected as the Triad Safety Employee of the Month. John maintains a high level of safety in the field and laboratory, while making sure other employees in the laboratory are working safely as well. PPE usage in the lab is vital, and John has contributed to increased PPE usage and an improved safety culture within our laboratory operations. Our lab performs a high volume of work in support of our Geotechnical and QC service lines and for many external clients and consultants. This work gets completed safely and efficiently, due in large part to John’s efforts! 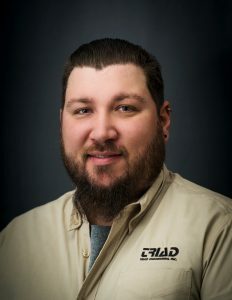 During his four years with Triad, John has maintained a perfect safety record while performing his duties. Triad’s Safety Employee of the Month for March is Rick Atencio! Rick Atencio, Engineering Technician II in the Scott Depot office, has been selected as the Triad Safety Employee of the Month. Rick maintains a high level of safety consciousness by consistently completing job hazard analysis sheets, always wearing proper PPE and being proactive with respect to vehicle maintenance. Rick has also provided many job site safety scenarios for Triad employees by submitting several near miss incidents. Rick has worked within most of the departments for the Scott Depot office and has a great understanding of what each department does and the safety issues they face. Because of his attention to safety, he has a unique perspective on looking at work tasks to determine any safety issues involved and implementing proper safety procedures whenever necessary.